It was a quiet weekend by comparison to many stakes-filled summer days. One event, however, took its place in pacing history. The HoosierCup, an Indiana tradition for the glamour-boy pacers’ calendar, was presented for the last time. This was, indeed, the final final for the half-million dollar race. The Hoosier Cup’s curtain came down memorably for those following our lead, as our choice, Custard The Dragon, won, paying a whopping $18.60. 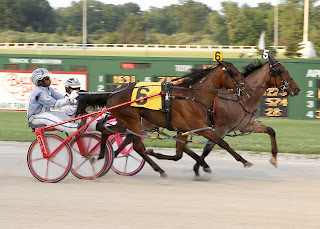 Indeed, he not only defeated the “now” horse, favorite Big Bad John, he also confirmed again our view that this year’s three-year-old pacing crop is talent-deep. Big Bad John was the favorite a week ago, in the North America Cup, but his 2011 winning streak ceased with the efforts of Up The Credit. 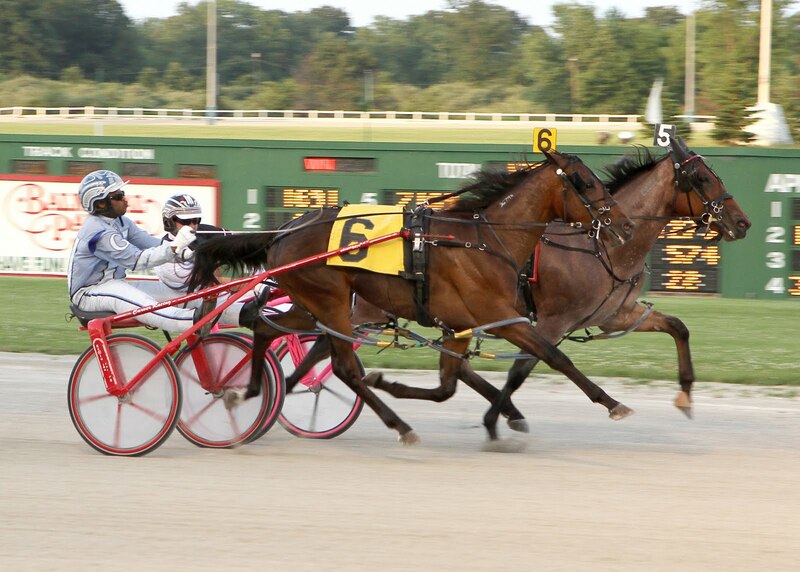 That one was not at Hoosier Park for their “Cup” but his absence did not cause “Custard” to inherit the Midwest win. Custard is a fine horse and trainer George Teague, Jr. has him battling the others with fervor. Another Teague student, Feel Like A Fool, finished fourth at Hoosier. He is still in the thick of the group, however. As well, Wink N Atcha, also from team Teague, was third and cannot be dismissed this season for some big checks. The others from the crop include Shadyshark Hanover, who lost in a sires stakes at the Meadowlands over the weekend, finishing third to Best Man Hanover and High Noon. “Shady” is not done making noise this season. Rollwithitharry won another sires stakes split that night. 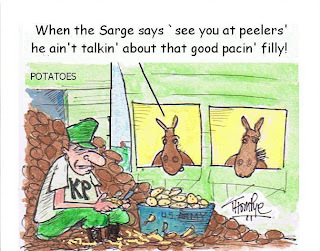 Roll With Joe has game, as does Powerful Mist and let us not forget that the magnificent filly pacer, See You At Peelers, is good enough to have beaten some colts already and aims for the Little Brown Jug, not the Jugette. On the trotting scene, we continue our exclusive coverage of races with eligibles for the two August classics, the Hambletonian and Hambletonian Oaks, at the Hambletonian Trail blog. Over the past few weeks we scored with Whitewater Rapids, Jezzy, Tigers Too Good, Rarely Ordinary, VC Chocoholic, Blue Porsche, Crème De Cocoa, Big Rigs, Whatever It Takes, Oh Sweet Baby and Pacific Splash. Not all of those winners were high-paying mutuels but the few that toppled favorites are keeping our pre-classic bankroll healthy. With a month until the eliminations, the possibilities for entries are lessening. Soon at the blog we will be narrowing those possibilities and concentrating on those money-winners that are most likely to show up in the eliminations. 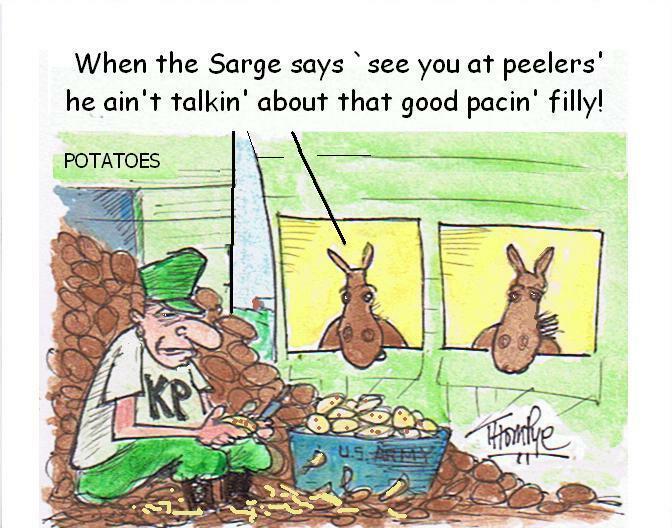 And, of course, we hope to be on site at the Meadowlands with tweeting and blogging for much of the big stakes week, as well as Hambletonian day. Follow the blog for previews and the Hambletonian Society web site for result stories and archives. Cal Expo will return to action on Aug. 26. The summer-fall meet will go through Dec. 17. The popular no-takeout Pick 4 is scheduled to return, as will our analysis of each week’s fields. We hit once since the special event began through TwinSpires for a profit playing the entire meet. Our goal is to hit twice and maybe more this summer through fall. The first three weeks of the meet will offer Friday and Saturday programs, with a three-day-a-week schedule beginning Sept. 15, when cards are presented each Thursday, Friday and Saturday (the only exception is Thanksgiving Day, Nov. 24. Plainridge Racecourse has made a few changes. Monday and Tuesday race programs move to a weekly, four-racing program schedule for July and August. Live racing cards begin July 4 to include Mondays, Tuesdays, Thursdays and Fridays, with a 4 p.m. EST post. The Appvalley apk is great with both the shocking working structures like Android and appvalley download ios . Furthermore, you needn't mess with an Apple ID for this particular application, which makes it progressively reliable and conceivable.